Investors are betting that humans turn to tech startups for wellness solutions. Wellness is not just a buzzword, it’s a $4.2 Trillion market and growing. It’s a movement and it’s happening now. Our society has taken a turn and people are more focused on their physical, mental and spiritual health than ever before. Being happy and healthy has evolved into a top priority. In walks technology…Apps and startups have enabled this movement by creating technology to address our mind, fitness, sleep, diet, reproductive health, environment and beyond. WellTech has been surging with innumerable apps and companies over the last decade. 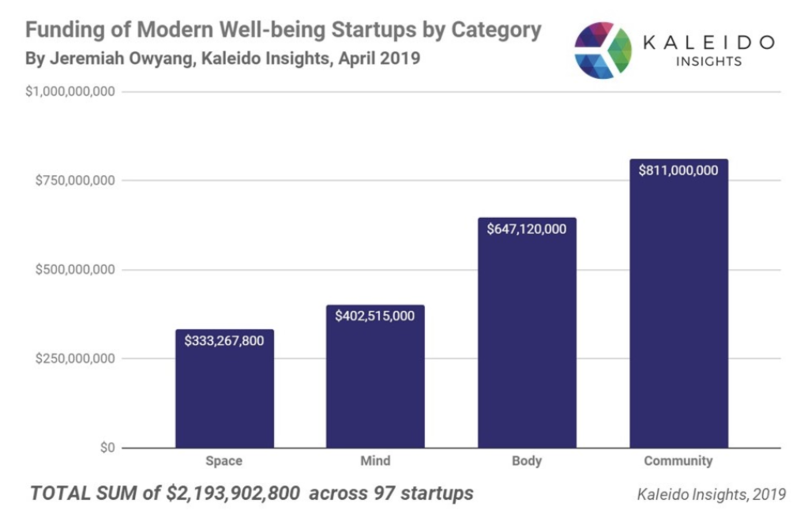 Investment activity has followed in suit with over $2.2B in investment in the 97 modern wellness startups we’ve identified as of March 2019. Rising healthcare costs have created a growing need for alternate options to address our wellness – physical, mental and spiritual. With increased healthcare costs, increased stress and ailments, and a growing trend toward happiness and health, the market is primed for wellness apps and technology. These technologies give users assistance in achieving overall wellness and help them take proactive measures for a healthy lifestyle. Modern wellness startups have stepped up to fill the gap. People are turning to consumer technology from Apple, Google, Amazon and others to solve these needs –they have less barriers to entry, despite some initial costs for hardware. 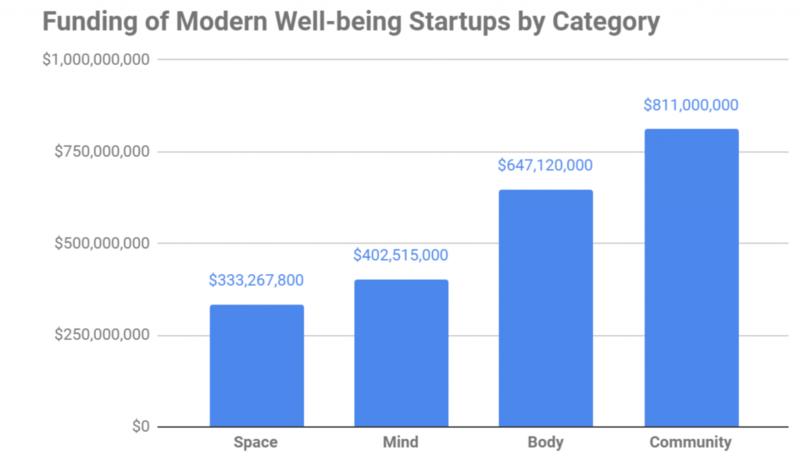 We have classified these wellness startups into four categories: Mind, Body, Community and Space (check out our detailed infographic on this space here). Mind includes startups addressing emotion recognition, intelligent assistance therapy, mental health, mindfulness, mood shaping and stress. Body includes connected apparel, fitness, health, nutrition, sexual wellness and sleep. Community includes the busy market of on-demand fitness and wellness, cryptofitness and on-demand elder care. Lastly, Space involves air, light, scent, sleep, sound, touch and manipulation of whole space. There are some outliers, like the newly-crowned $1B+ valued unicorn, Calm, a startup that helps users relax, sleep, or focus. Calm recently raised $88M to total their funding to $116M, a leader in the Mindfulness subcategory of the Mind category. Community’s large amount of funding is lead by ClassPass, a subscription-based fitness app, at $239M and Practo, a medical advice and booking app, with $234M. These are both large startups that have matured and have accrued funding over the years. The Community category, which incorporates the on-demand fitness and wellness providers, is pretty saturated with lots of emerging startups and investments in the last couple of years. We expect this to flatten out. Mindfulness has been heating up, expect more here, especially with Headspace, a meditation and mindfulness app that will match funding and valuation to rival Calm. Also, be on the lookout for funding in the Intelligent Assistance Therapy sector, with startups like talkspace, an online therapy app. In the Body category, we’ll see growth in Nutrition startups like uBiome which provides microbiome testing, and habit that offers personalized nutrition, like highly-anticipated Lumen. 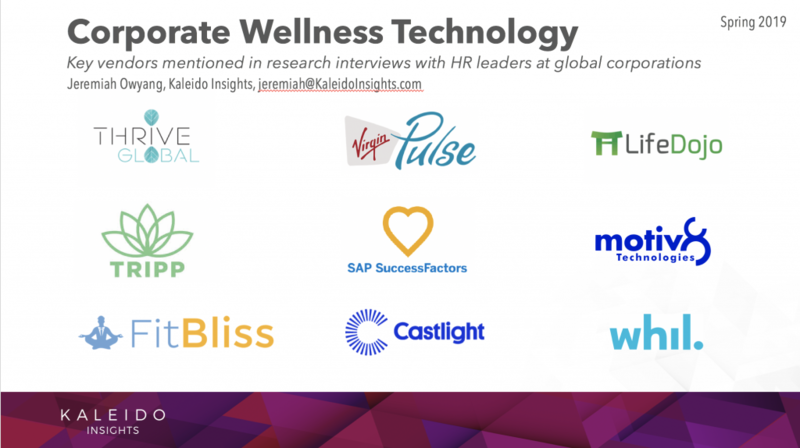 Corporate Wellness Technology (CWT) Platforms. Employee wellness solutions that combine multiple features into one suite. Corporations are adopting these technologies for employee wellness, yet they are loosely strung together and lack a cohesive experience. Data and analytics that measure actual human improvements. There’s a need for analytics that combine biometrics to actually gauge if wellness practices are making a long-lasting effect beyond just simple usage this is for consumer level, crowd aggregation, and at societal level. We’ll also see acquisitions that create super apps that offer comprehensive wellness platforms that address mind, body, community and space. Google and Apple are likely contenders in this arena, but there’s certainly room for an independent startup to take this on. Large sports brands like Nike, Under Armour and Reebok have an opportunity to step forward to lead on this, as well. We have a spreadsheet tracking these top 100 startups and will report on a periodic basis how this market is shaping up. In 2019 expect to see these 6,000+ newly minted millionaires, most from Silicon Valley & San Francisco. In about two years, 2021-2023, many of these employees will cut ways with their employer, ready to start new companies, or angel invest in the local startup community. Despite the other industries to be in an expected recession, tech startups may still be seeing funding. Who wins: Entrepreneurs, tech workers, VCs, LPs, Silicon Valley real estate owners, and developers. Who loses: Renters seeking to buy a home, non-tech workers, Silicon Valley traffic. More innovation will come out of Silicon Valley, as additional funds are injected into the ecosystem. Employees are burning out, losing sleep, becoming less healthy, and being compounded by stress. 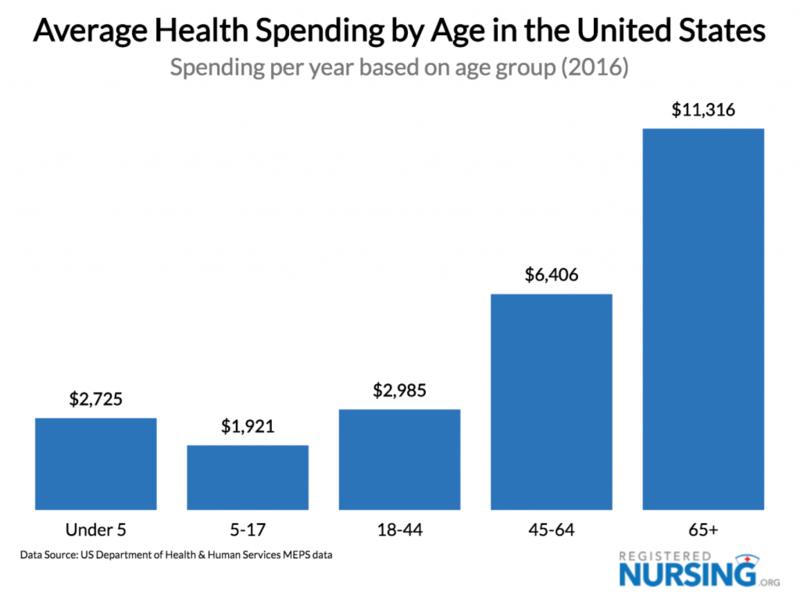 Furthermore, healthcare costs continue to increase as companies struggle to maximize the productivity of their employees while also retaining them. It’s ironic in many ways, but companies are turning to technology to help employees cope with too much technology. Here’s a summary note from our deeper research on this space after interviewing dozens of companies, startups, experts and attending events. With 80% of today’s companies offering wellness programs, there is a massive market for services in this space. Apps and comprehensive platforms are filling the needs of employers to provide wellness and engage their employees with wellness offerings. From on-demand meditation to one-stop-shops for all that is wellness, we’ve rounded up a who’s who in today’s corporate wellness tech space. Before we go on, we’ve found multiple companies that have deployed mindfulness programs or fitness programs that intentionally do NOT use technology, in particular Google’s spin-out of Search within Yourself teaches individuals to be mentally resilient and mindful without tech aids. We also heard from HR wellness industry experts and authors like Joel Bennett and Laura Putnam (thanks Janet Fouts for the intros) that if the company’s culture is mis-aligned, no technology or mindfulness practice is going to solve the bigger issues. So take heed before deploying tech without having a broader strategy. Thrive Global offers a behavior change product suite to improve the well-being and performance of employees based on behavior change science. After her own exhaustion-fueled collapse, Arianna Huffington founded Thrive Global to reduce stress and burnout and promote wellness. Its offerings focus on these pillars: Integration of Work & Life, Whole Human Approach, Steeped in Science, Actionable Microsteps, Personally Immersive, and Global Scale. In addition to their corporate product suite, Thrive Global has a large wellness content network. Virgin Pulse equips employees with knowledge, tools and support to build healthy habits to last a lifetime. The core mission of Virgin Pulse is to help businesses reduce healthcare costs, improve business performance, build a great company culture, integrate and optimize benefits and HR investments. A major part of their program is the Global Challenge, a 12-month employee fitness challenge. Virgin Pulse is part of Sir Richard Branson’s Virgin Group. Life Dojo connects employees to their goals and transforms physical, mental and emotional health, one lifestyle change at a time. Life Dojo offers a behavior change platform to address employer’s issue of under-utilized benefits for disease management, behavioral health, well-being. The programs that they offer include healthy eating, exercise, stress, resilience, sleep, stop smoking, financial skills, and they provide coaches to help employees reach their goals. They boast a number of clients, many who are fast-growing technology companies. FitBliss offers a well-being platform that maximizes work performance through better health. Employees can manage their well-being with personalized tools, social engagement, and recognition for achieving their goals. The FitBliss platform includes well-being gamification, health education, health apps & wearables (integrates with most of today’s activity apps – Fitbit, Apple Health, Garmin, MyFitnessPal, Strava, Google Fit, Apple Watch, Runkeeper, Misfit, & more), wellbeing collaboration, employer program insights, personalized health management with an AI feature, and FitProductivity on Salesforce. Their platform integrates with Slack and Salesforce. Castlight Health helps employees better navigate their health options. The focus of Castlight is to reach employees before they make care decisions, and guide them to the highest quality, lowest cost options. They integrate the complete health journey, all in one app, where they can access resources for staying healthy, access their care options and manage their conditions. This is all through the Jiff app acquired by Castlight Health in 2017. Whil is a digital well-being training solution that helps employees reduce stress, increase resilience and improve their wellbeing and performance for happier, healthier and more engaged workforces. Whil offers 250+ science-based digital programs for mindfulness, sleep, emotional intelligence skills and more for happier, healthier employees. Goal-based resilience training for high performing cultures. Employees improve their mental and emotional wellbeing in micro learning sessions focused on the 12 aspects of employee well-being. TRIPP is virtual reality that provides mindful, productive breaks. It offers companies of any size a turnkey solution that improves emotional and mental well-being in the workplace through a fun, engaging and innovative experience. Employees can easily launch TRIPP during breaks to help reduce stress, improve overall team productivity and morale. You put on the headset and it takes you through a meditation experience without the work – on-demand meditation in the workplace. I’ve asked this group to present at client engagements, as the only way to really experience this is in-person. Motiv8 combines research with machine learning and AI to determine the best behavior change approach. This is an up-and-comer, it’s key to watch new entrants – not just established players. By understanding what makes each person unique, Motiv8 uses data science to select the most effective research-validated approach to support employees on their health journey. Founded by long-term entrepreneur from the social business space, Eugene Lee, one to watch. SAP SuccessFactors “Work-Life” Is an upcoming feature on the already successful SuccessFactors platform that will that helps employees “thrive” at work and home. This solution provides personalized well-being resources and provides employers with aggregate data to identify employee stressors in real-time. This helps companies to improve productivity and their bottom-line. SuccessFactors uses wellness content provided by Thrive Global. Honorable mentions of consumer apps that are now selling to enterprises: Calm, Headspace and Muse. They offer a variety of syndicated offerings that can be available to large employee bases. In particular, Calm recently raised $88M in funding a few months ago, and is now valued at over $1B. Headspace has clients in the airline industry, NBA, Genentech and many large companies and finally Muse is offering their solution for companies to give active feedback to employees on their mental focus by using their headset device and app. Company Type Main Benefit Additional Features Year Founded Funded # Empl. With the rise of wellness, it’s no surprise that we see such robust and established players in the HR Corporate Wellness Technology space – as well as new, emerging technologies addressing employee wellness. There is technology to gather all benefits in one place, track activity, delivery therapy and coaching, video and written content, provide access to standard health benefits and more. The idea is to make it easier to be well and do your job better. While many companies roll out technology to employees to help them deal with focus, productivity, and happiness, we want to be sure to remind companies and business leaders that the most important strategies aren’t just technology, but ensuring your company culture lives by these values, executives are practicing these wellness behaviors, and employees are given permission to use them. Photo by Pexels, used within license. Above Funding Chart based on research by Kaleido Insights. This post first appeared on the Technomy website. Roadmaps directionally guide us when situations are unclear. To guide me, I often used this framework in client work, speeches, and beyond. It serves us to see how technology is rolling out in our lives, as Scott Monty said, it could a “chart of your life”. It’s not just for me, it’s for all of us to use in our personal and professional planning. As we approach the anticipated recession, now is a good time to publish this roadmap, as we’ve seen economic conditions shape each era. For example, in the Internet Era, the dot coms experienced a shakeout in the 2001 recession. Next the Social Media era became a low-cost channel in the next economic downturn and the collaborative economy birthed in the 2008 recession as people struggled to stay in homes, and get what they needed, cheaply. The same will happen in the next recession, technologies will reduce costs, increase efficiency, and humans and businesses will turn to them to increasing their adoption at an exponential growth rate. It’s worth noting that these eras often happen in overlapping waves. One era doesn’t start and stop, they overlay each other, and obviously interact with each other. For example the Collaborative Economy era (like Uber) will soon become the Autonomous World era, as the cars become self-driving. When: Mid 90s, “popped” in 2001. Currently a matured market; nearly all internet users access these services. Gained traction in 2005, gained market adoption during 2008 recession, most internet users use these platforms multiple times a day. Many companies birthed in 2008 recession, when people were resource strapped. Undergoing growth for decades, there have been many surges and ‘winters’ Early Fitbit emerged in 2007, Nike’s Fuelband emerged in 2012, spurring a craze. Since then hundreds of wearables attracted mainstream attention. Description: Every media, business, and entity created a website to share information and enable commerce; “dot com” boom. Free, low-cost people-created media, and used by marketers to reach customers. Peer-to-peer commerce platforms emerged during recession, enabling people to get what they needed from each other. AI technologies simulate human intelligence by replacing and augmenting simple repetitive tasks to more complex problems. Consumer accessible technologies improves humans minds, bodies, physical spaces around them, and communities. Benefits: Birth of business to consumer ecommerce. Peer to peer communication changed the flow of information power. Near real time services, sharing of resources can improve sustainability, human connection. Reduce humans painful toil of hard labor, repetitive tasks –solve complex problems Humans can improve mental capability, increase longevity, enjoy happier, more content lives with their loved ones. Downsides: Many failed startups from lack of monetization, “dot bomb”. Traditional retailers and middleman struggle to compete. Privacy woes. Monetization of user data in questionable ways. Digital addiction, psychological damage, social dynamics changed. The sharing companies and their investors became 1%ers, some models increased congestion, and workers rights often trampled Top fears include: robot overlords enslave humans, job loss, lack of human/work purpose, unforeseen ethical dilemmas The concerns over data privacy and over reliance on technology in our lives continues to grow. Winners: Google, eBay, PayPal, AOL, Alibaba, Amazon, Netflix Facebook, Twitter, LinkedIn, WeChat, Weibo, Snap, YouTube, blogging platforms. Uber, Airbnb, Lyft, BlaBlaCar, Ola, DiDi, Careem, Lime, Bird. Fiverr, UpWork The race is far from over, but current leaders: IBM, Palantir, Google, Amazon, Apple, Nvidia This battle is still being fought, but Apple, Google, Calm, Headspace, 23andMe, Ubiome lead the market. In prior versions, I had the first three eras, four eras, then added in the fourth. 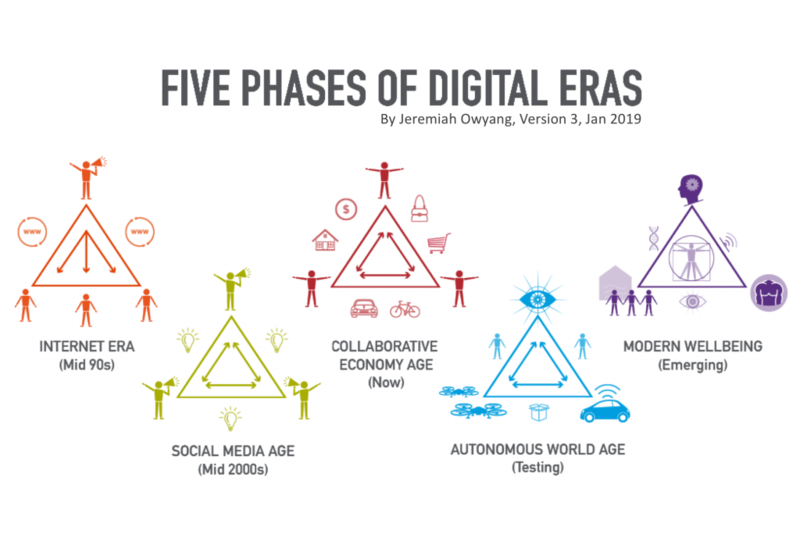 While I’ve been eyeing the fifth era, Modern Wellbeing era, for about a year (prior we called this a quantified self), I waited until the right time to publish this in public. With many mindfulness apps and features emerging, new devices that measure heart rate variability and others coming, I can see how this trend is starting to develop. With that said, what’s the six era? I’ve some early ideas, but it would appear as unrealistic science fiction at this stage. Love to hear your reactions to this view of how technology is going to roll out. Which era are you currently focused on? How will you plan for the next phase?